Congress' Immigration Push Sputters as Guns Grab Attention - Integration Through Media ....! 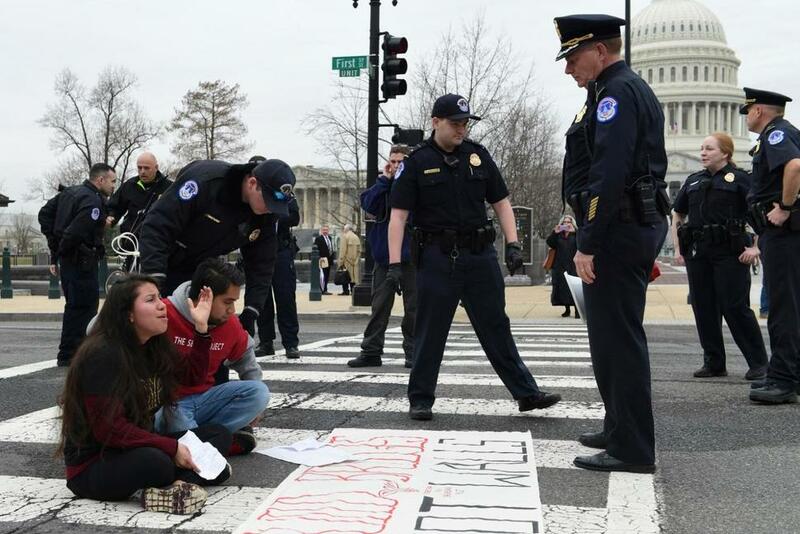 WASHINGTON (AP): It’s taken just two weeks for Washington’s immigration battle to fade from blistering to back-burner. Lawmakers now seem likely to do little or nothing this election year on an effort that’s been eclipsed by Congress’ new focus on guns, bloodied by Senate defeats and relegated to B-level urgency by a Supreme Court ruling. Talks have gone dormant that sought a bipartisan package: A chance for citizenship for young immigrants brought to the country illegally and $25 billion for President Donald Trump to erect his treasured wall with Mexico. Even a proposal dangling modest wins for both sides — a three-year renewal of a program protecting hundreds of thousands of those young immigrants from deportation in exchange for a $7.6 billion down payment for the wall — seems a longshot. “The prospects for immigration legislation, big or small, are very, very bleak,” concedes Frank Sharry, executive director of America’s Voice, an immigrants’ rights group. Distrust between the two parties has intensified, with each suspecting the other of weaponizing the impasse to rouse loyal voters for November’s contest for congressional control. There are tactical rifts between Democrats and the coalition of liberal and immigrants’ rights organizations over how aggressively to force the issue, and differences between conservative organizations and some Republicans over the wisdom of even a narrow accord. Looking to furnish political cover to rank-and-file Republicans, House Speaker Paul Ryan, R-Wis., and Senate Majority Leader Mitch McConnell, R-Ky., only want to consider immigration bills that have Trump’s support. Democrats say Trump’s portrayal of immigrants as threats who commit crimes and steal jobs, plus his vulgar references to their countries, shows he’s not serious about compromise — yet leaves him pivotal for any deal. Rather than making new offers, Trump is blaming Democrats for the stalemate. “I’m the one that’s pushing DACA and the Democrats are nowhere to be found,” he tweeted days ago, referring to the Deferred Action for Childhood Arrivals program. Hoping to recapture attention, immigrant and civil rights groups plan demonstrations in Washington and elsewhere on Monday. When Trump announced last year that he was terminating the program, he gave Congress until that date, March 5, to replace it. The program, which President Barack Obama created administratively without enactment of a law, lets immigrants brought to the U.S. illegally as children get jobs for renewable two-year periods. It’s currently protecting 680,000 of them. The Supreme Court this week erased that deadline’s impact with a ruling that requires the administration to renew DACA permits while lower court challenges to Trump’s action continue. Those lawsuits could drag on for months, easing pressure on Congress to act quickly. Lawmakers are now fixated on last month’s shooting deaths of 17 students and faculty members at a high school in Parkland, Florida. The shift accentuates how rapidly priorities shift in Congress, fueled by today’s hyper speed news cycles and a president whose tweets and utterances add additional volatility. Last month, the Senate rejected a Trump proposal offering citizenship to people protected by DACA, fully financing his wall, cutting legal immigration and ending a visa lottery for people from countries with low U.S. immigration rates. A bipartisan plan backed by nearly all Democrats included potential citizenship for DACA recipients and money for Trump’s wall, barred the young immigrants from sponsoring their parents and left the visa lottery intact. Neither side is showing any indication of sweetening its offer. Democrats face pressure from liberal groups like Indivisible and United We Dream to use coming budget legislation to crimp money for immigration enforcement programs. But with several Senate Democrats facing tough re-election fights in Trump-friendly states leery of that stance, the party has little leverage. Sen. Jeff Flake, R-Ariz., who’s joined bipartisan efforts to forge compromise, says he’ll try forcing a vote next week on his plan to extend DACA for three years and supplying three years of financing for Trump’s wall. But many Democrats oppose it, saying they abhor financing the wall in exchange for merely a temporary DACA extension. Groups like the Center for Immigration Studies that favor tight restrictions are also opposed, saying it would inscribe DACA into law, and conservatives such as Sen. Mike Lee, R-Utah, seem certain to block Flake. Flake said he’d keep trying anyway. “At some point we’re going to want to put this behind us, even if there’s no deadline. I don’t think this plays into our favor in the midterms,” he said. In the House, Republicans are hunting votes for a conservative package that cuts legal immigration, requires employers to verify workers’ citizenship and makes it easier to deport immigrants who are drunk drivers or gang members. Facing solid Democratic opposition, GOP leaders remain short and it’s unlikely they’d consider more moderate alternatives that lack majority Republican support.